Sometimes one is forced to stay somewhere, and sometimes one finds without really looking for it something that appears to be worth the detour, as the Michelin green guide says. That happened when we had to stay in the Southern (Roman Catholic) part of Netherlands for a couple of days in order to acquire a new passport. 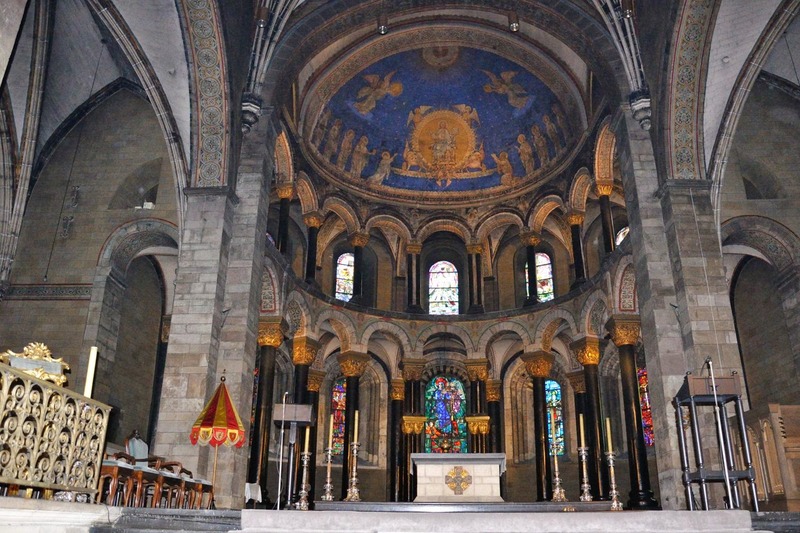 The Romanesque churches of Maastricht as well as the one in Roermond I only knew from the pictures on “L'Europe Romane”, and both towns are located less than an hour drive from Den Bosch, where we were staying. 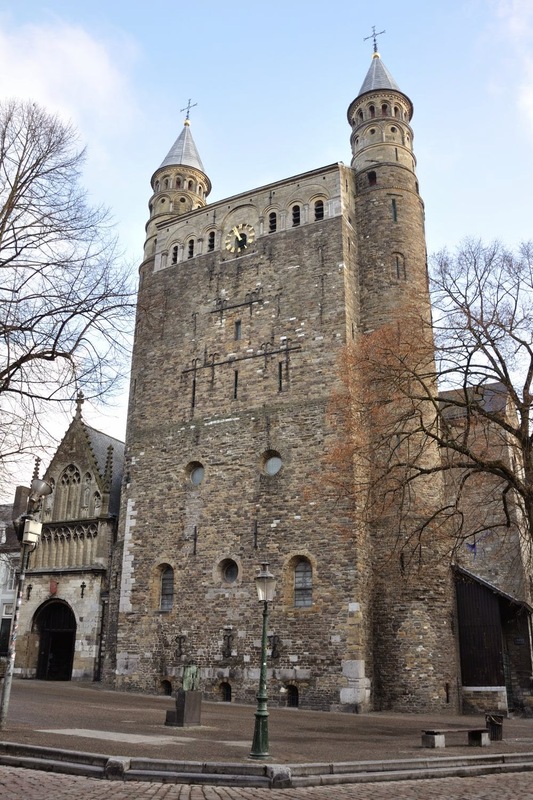 In Maastricht we could park the car in a parking garage next to the Basilica of our Lady, which was open to the public, and which turned out to be a revelation. 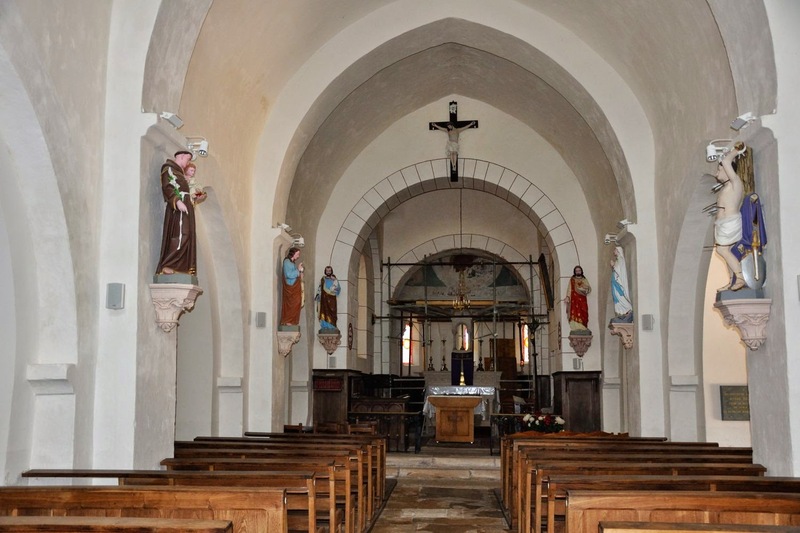 The capitals in the apse, where it is too dark to see anything properly, can be lit after inserting a € 0.50 coin in a switch box, an investment more than worth it. 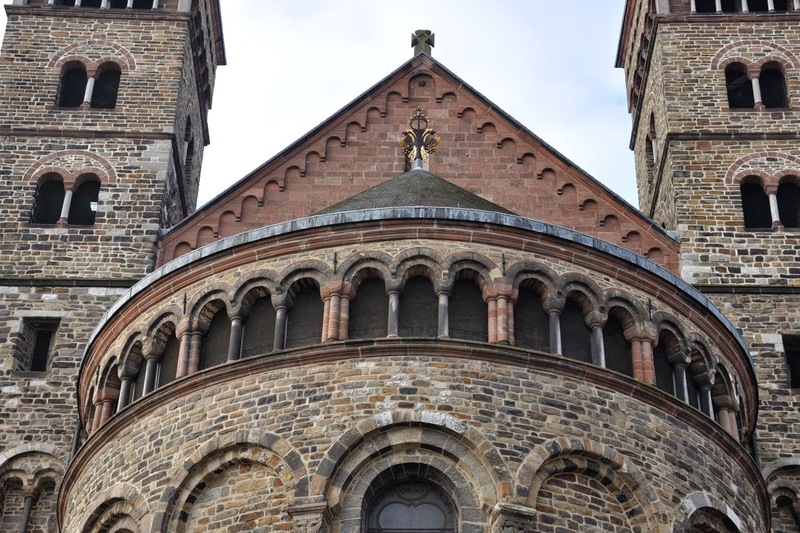 The outside of the church, in Mosan and Rhineland style is very impressive. The architecture is completely different from the one we know in Burgundy. Only when we left the church I saw the notice “No photographing”; too late, fortunately! 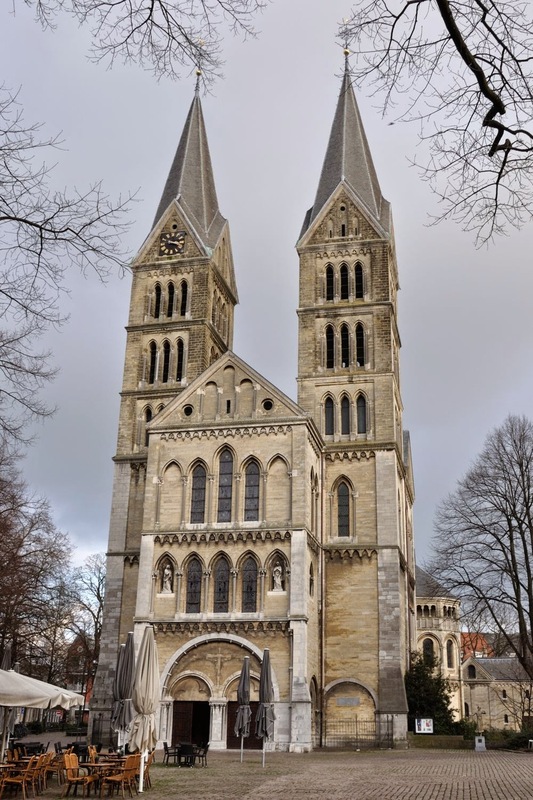 The Saint Servatius basilica I found, at least from the inside, less interesting. However, I must add that the Emperor’s hall (certainly worth a visit) is closed for visitors during winter, and in summer can only be visited during guided tours. However, the treasury with among other things the reliquary of Saint-Servatius made up for what we missed. 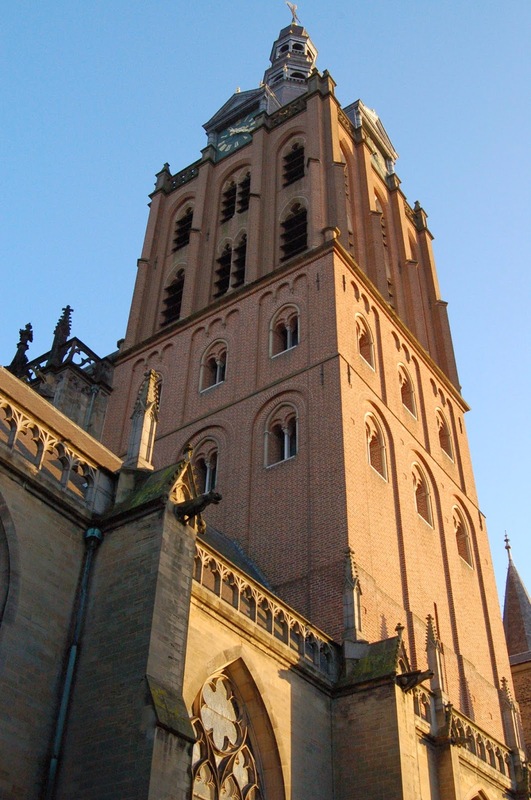 On our way back we made a stop in Roermond, where we found (with difficulty) the Minster of our Lady. This church however was closed, and in winter only open on Saturdays during 2 hours, and in summer on weekdays during 3 hours. Although we managed to peer inside through a glass door, I would have preferred to walk around at my own leasure. Having been born and bred in the Calvinistic Western part of the Netherlands, the almost Burgundian atmosphere in the Southern part of the country was a pleasant surprise to me, even on a cold, windy day in winter. I will certainly go back to Maastricht if we ever happen to be in the vicinity on a warm, sunny summer’s day! We have seen almost all churches in the vicinity, inside and outside. However, there are still two churches on our list of buildings of which the inside could do with some proper photographs. 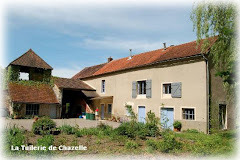 A group of people have been busy for a couple of years now, during the summer, with the restauration of a ceiling painting in the apse of the church of Buffières. During winter there is no work done, but the scaffolding is still there, which makes it impossible to take some proper pictures of the apse. 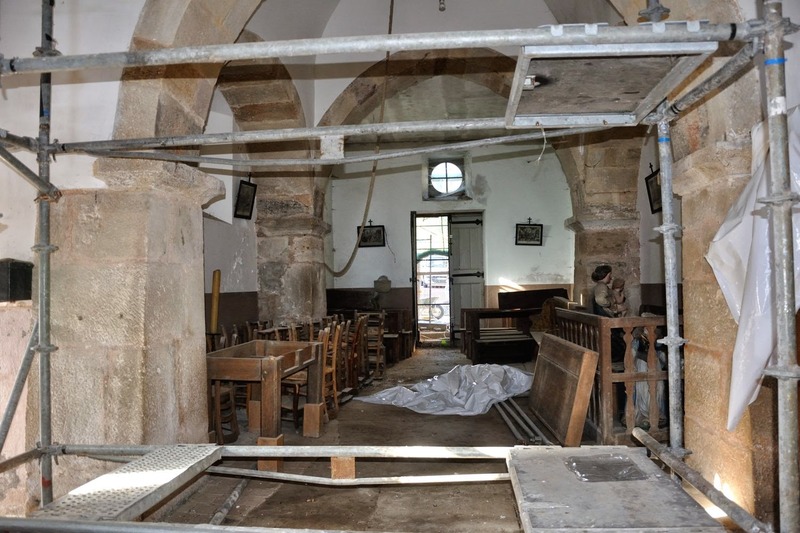 An article in a local paper suggested that the works would be finished in August 2014, but a visual inspection in September denied that, and a phone call to the organisation that finances the restoration learned that the work will continue in 2015. The church in Milly-Lamartine has been closed for a couple of years due to danger of falling debris. When we decided to check again on a day the town hall would be open, we noticed that some restauration work had started. The roofers that were occupied with it had left the side portal of the church open, which enabled me to have a quick snoop inside. The renovations should be finished before May 2015, according to a sign outside. The falling debris sign however is still nailed to the door. Ougy has a church which has been amply covered by me. 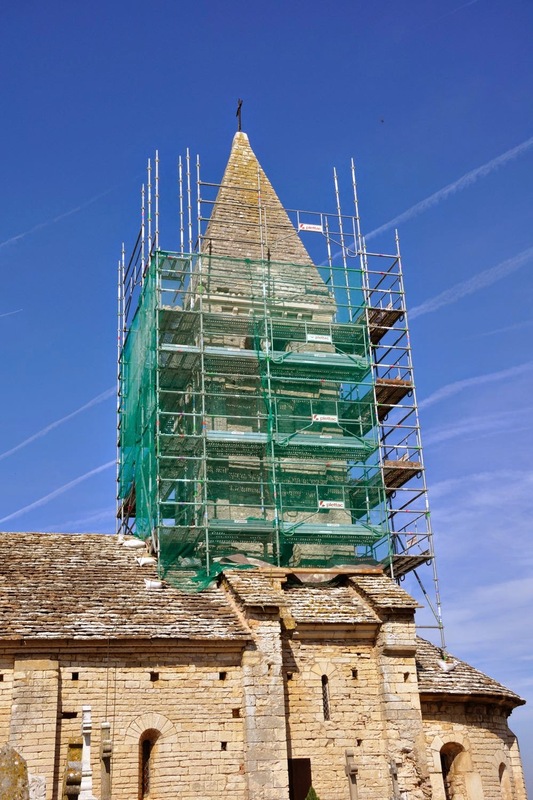 When we passed by there for a completely different reason, we noticed scaffolding and a notice board about the restauration of the church. Hopefully they will be able to do something about the moisture ingress, a problem of which a lot of old Romanesque churches are suffering.